PrintPrint specializes in creating high-quality, professional illuminated signs in Vancouver, BC. If you’re looking to attract more atention to your business without having to put up a large investment, our illuminated signs are the perfect solution. Made from the highest quality materials, our illuminated signs can help you attract customers both during the day and at night. We offer basic signs made from high-quality, translucent layered vinyl and LED lights. These are ideal for smaller, more basic projects and can be powered through a standard power outlet, meaning will not be required to provide an electrical installation permit to the Vancouver council for installing these signs. We also offer backlight signs, which are usually more elaborate and can be made to include several different designs superimposed on top of each other to create maximum effect. These signs can create a stunning halo effect and are great for emphasizing lettering. Below you’ll find some samples of our illuminated signs. For more information about our prdocust and to discuss the specific needs of your project, contact us today. To find out more about our full range of sign printing services, click here. 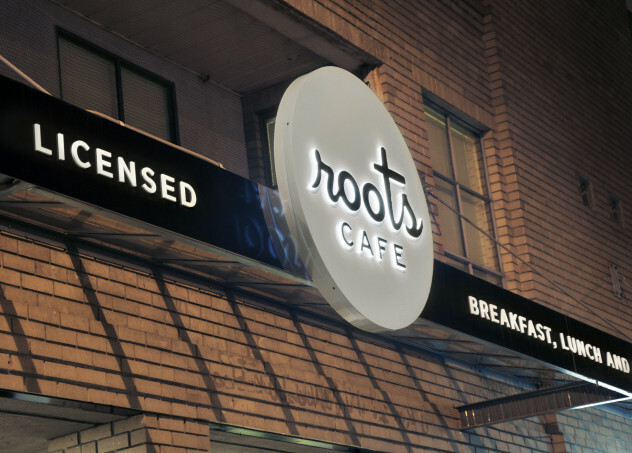 Roots backlit illuminated street sign, Vancouver BC.